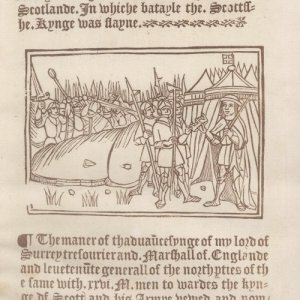 The transcription and translation of this document known as “The Trewe Encounter or Battle” is the first printed account of the Battle of Flodden. The undated document in Old English was written after the battle, probably by an Englishman from a verbal account, and closes with the words “Imprinted by me. Richard Faques, Dwelling In Poulys Church Yard”. One copy of the document to which I had access has missing pages, as in one instance the narrative doesn’t follow on. These pages are included in a subsequent copy of the document (See para. 3). In 1867, at the “Proceedings of the Society of Antiquaries of Scotland” a paper was presented by David Laing Esq. 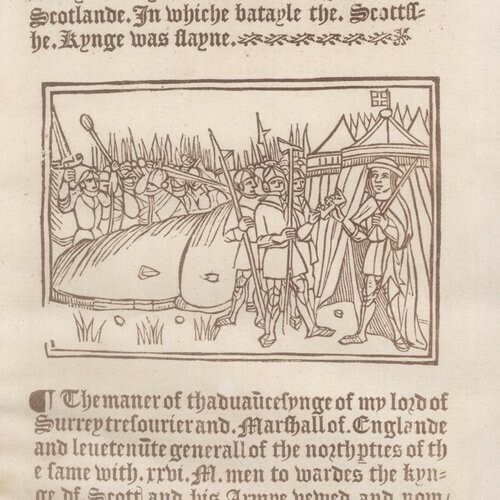 LLD (VPSA-Scot) who had discovered a printed document at a sale of autographs, and was able to identify it as a report of the Battle of Flodden. On closer inspection he was surprised to find it was almost an exact copy of the original document except that it included the missing pages. It would appear that the person who initially made this report was not familiar with the area, as the account states that “My Lord Surrey . . . removed to a field called Wooler Haugh within 3 miles of the King of Scots”. Flodden Hill is in fact nearer 7 miles from Wooler Haugh, and in the extra pages it also states that on 8th September the whole English army moved from Wooler Haugh to Barmoor “within sight of the King of Scots, at the furthest from him within 2 miles”. At the closest the English army would never be nearer than 5 miles from Flodden. Many books have been written about the Battle of Flodden by a number of eminent authors, all of whom appear to base their work on “The Trewe Encounter”, albeit with their own interpretation of the circumstances. No mention is made as to the positions of the English or Scots guns. However, in an account of the Battle of Flodden by Robert White published in 1848, he includes a sketch plan of the “battles” which shows the position of the guns of both sides, but there is no indication of the origin of this information. On leaving Flodden Hill, the Scots army were said to have burned all their rubbish to provide a smokescreen for their movements. If the army was moving directly from Flodden Hill to Branxton Hill, they themselves would have been marching in clouds of acrid smoke if it hid the manoeuvre from the English. They also allegedly left the baggage train, later found intact by the English. Would they have started a big fire in the vicinity of a baggage train they intended to recover? Was it also wise to create a smoke screen which would effectively obscure the advance of the English Army unless there were watchers at strategic points to report back, and how long had they been in position to warn of the imminent attack? “The Trewe Encounter” states that “The said King of Scots did cause his tents to be taken up and keeping the heights of the mountain, removed with his great power and pursuance of people out of the said forest towards Scotland”. This seems to suggest that he moved his entire force, baggage train, guns – and army, westwards, along the ridge of Flodden Edge as far as the heights of Branxton Moor, also within a short distance and sight of Branxton Hill but with an angled approach – southwest to northeast. Coldstream (Scotland) is clearly visible from here, downhill and only about 5 miles distant. These are only some of the many questions remaining after reading this document, but going back to the original primary sources has given me the opportunity to try to understand much more of the circumstances surrounding the battle and to realise that subsequent reports are not completely reliable. There is always the temptation to embellish - either accidentally or otherwise - any report passed by word of mouth and it would appear that this has occurred several times during the past five hundred years. My interest in the Battle of Flodden Field continues and I hope that in the not too distant future further evidence will become available so that many of these questions will be answered.